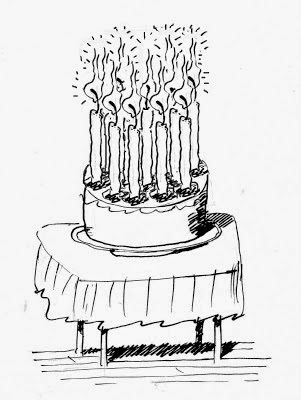 Lots of candles on that cake you say? 5 years already you say? Still going strong in raising awareness and money for the Michael J Fox Foundation? The answer is yes. Five years of and over $200,000 of donations and we are still going strong. Want to know a secret? I wish I had never had to start this. 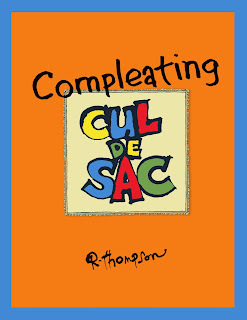 I wish Richard Thompson was still drawing Cul de Sac and instead of planning this years Drink and Draw at Heroescon, we were planning on Richard and Mike Rhode visiting Heroescon and us seeing old friends,having Fuel pizza, going to Merts and having craft beer from Asheville. Life is life and we roll with it. Instead of doing nothing we have done something. Something good and something to be proud of. If you have never had a chance to help here is your chance. On the evening of Friday June 19th (also my 45th birthday) we are having our Team Cul de Sac Drink and draw in Charlotte, NC after the first day of Heroescon! More details soon on all the details but first we want to ask for help. 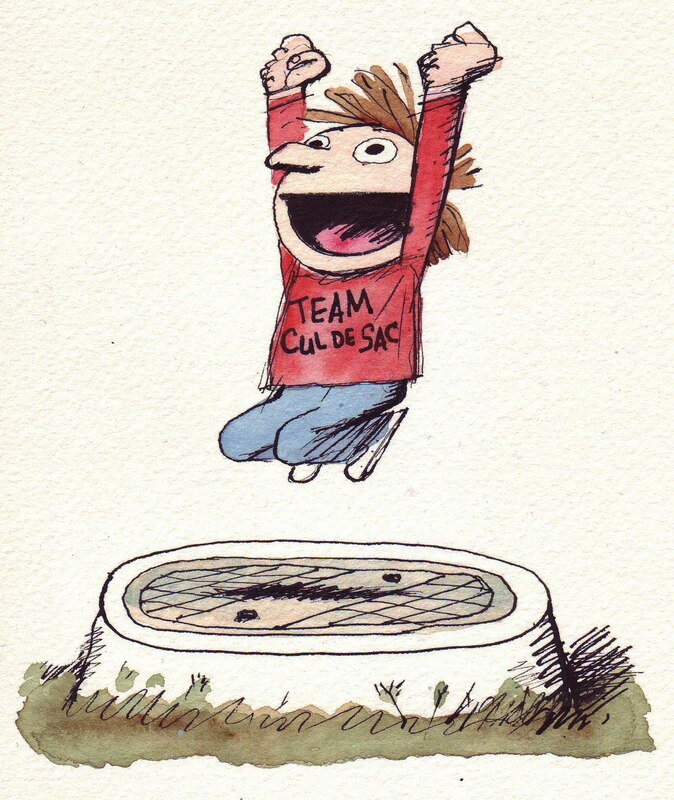 Below you see Alice jumping on her manhole with her Team Cul de Sac shirt on. She has been our mascot for 5 years! With our Drink and Draw coming up, I thought it would be nice to have a 5 year anniversary print only available at Heroescon. here is where you can help. Donate art featuring the Cul de Sac gang. The theme is the 5th Anniversary of TCDS and the Drink and Draw. Go wild. The winning entry will be picked by Richard Thompson, Mike Rhode and myself.All art must be mailed to us and even if your art is not picked you still win. You are helping us by donating the art to our Drink and Draw. The winner gets a really cool gift. How cool? Trust me its cool. All submissions must be in to me by June the 9th. You can send a digital file to us at teamculdesac@gmail.com so we can catalog and promote the art but you are not entered into the contest until we receive the original art. Remember June 9th is the deadline. If you are at this years Reuben awards you can give the art to Mike Rhode or myself. Plus, if you want to donate original art not related to the contest for the Drink and draw auction, please send it to the address above! A superhero thank you to Heather, Seth and Shelton and everyone at Heroescon that supports us year after year. Next week I will be in Washington DC to see some old friends and meet new friends. We all have one thing in common, we love cartooning. I have never met a nicer group of folks in the world. My first Reuben Awards I crashed in my hometown of Asheville in 1997. Sergio Aragones was nice to introduce me to just about the entire Gang of Idiots from Mad Magazine. A weekend I will cherish forever. My next Reuben weekend (2011) was when our favorite, Richard Thompson won Cartoonist of the Year in Boston. 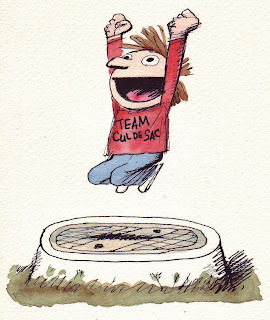 I was raising awareness for our up and coming Team Cul de Sac project. Everyone treated me as family, Another weekend I will never forget. Then 2012 rolled around and I ended up in Las Vegas for the Reubens. 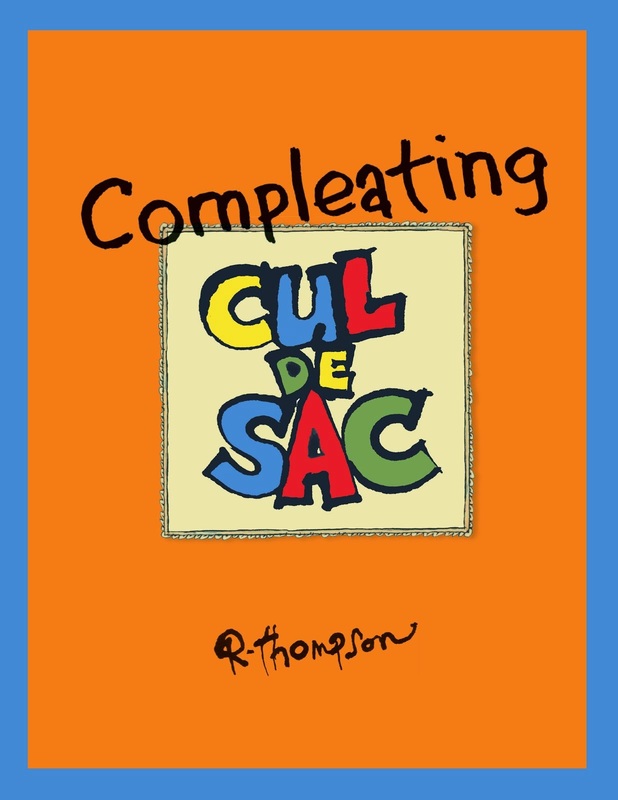 That weekend our Team Cul de Sac book was launched to the crowd of many of our contributors. Nervous, yes. Proud of what we were accomplishing HELL yes. Everyone was so supportive and again it was like the best family reunion ever. The Reubens in 2013 turned out to be pretty awesome too. I was now a member of the best family ever. Oh and if that wasn't enough I had the privilege to play tennis with Bill Hinds and Rick Kirkman! Here it is May 2015 and I am planning my family cartooning reunion in Washington DC. Next week I will be seeing Richard, Mo, Hilary,Rick, Shaenon, Andrew,Bill, John, Lucy, Lee,Tom,John, Nick and so many more. Family. Remember being a blood related is just blood and it washes off. Good ink won't. BTW, if you see Mike Rhode, please give him a inky hug. Mike is now a family member. Long overdue.